The Spy of the Heart - An exploration of Islamic spirituality from within the turmoil of Afghanistan. 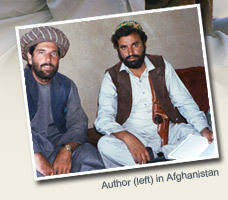 The story of one American's exploration of Islamic spirituality from within the turmoil of Afghanistan. 45 color photographs, several sketches, and 3 maps. Between 1985 and 1990 I travelled in and out of Afghanistan delivering medicines and humanitarian aid to those affected by the war with the Soviet Union. I learned Persian while working with the refugees and became friends with many of them. While there I observed how the war brought religious fanatics to power and attracted militant zealots from all over the Islamic world, and how the United States funded organizations that preceded and helped shape the Taliban. These were seeds that would lay the groundwork for the events of September 11th, 2001. Although it includes some political analysis, this book is also an exploration of Islamic spirituality. It was within the chaotic setting of the Afghan war and its sectarian struggles that I was drawn into the heart of Islam�ultimately to convert. After decades studying Afghan culture and spirituality, I felt it was time to share what I have learned from my companionship with various teachers of Islam and from my efforts to follow the Sufi way. Though I risk being misunderstood, I have chosen to write openly and honestly about my experience of Islamic spiritual practices that may be unfamiliar to many; my goal is for the reader to gain some sense of what Islamic spirituality is actually about. I offer this account of my travels and experiences with the hope of addressing questions about Islamic faith and culture. Perhaps the reader will gain a broader perspective about the troubled relationship between the Islamic world and the West. Despite my many travels to countries around the world, I have never been so moved and challenged as when I was in Afghanistan; nor have I ever encountered a people more brave, hospitable, and ingenious than the Afghans.